Have some candy bars that are begging to be used? Make a batch of super simple blondies to share. It's a perfect way to use up leftover Halloween, Christmas and Easter candy. I am so sorry! I don't know how I let this happen. I went a full week and the closest thing I posted to a dessert was some healthy muffins and a little homemade jam. What was I thinking? I wasn't obviously! I will try to do better next time. In all honesty, I have been trying to clean up my act a bit and not post quite so many sugar laden recipes. I mean they are good, don't get me wrong. The problem with posting multiple desserts in a week is you have to eat said desserts. Of course I don't take too much issue with extra desserts, but there is a limit and my jeans say we are there. Don't worry, it's not like we are going to have a total ban on sweets. Just a proposed slow down. Maybe. For a while. But it is fall soon and I love pumpkin and apple treats and after that it's Christmas... so lets not hold our collective breath or anything. 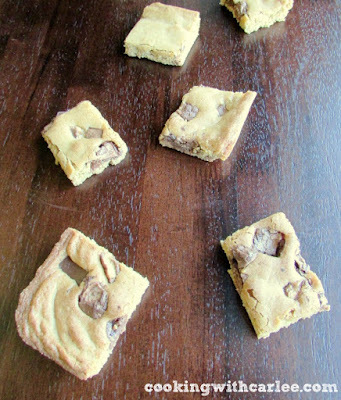 As a peace offering for the supposed slow down that I may or may not follow through on, I am giving you a big batch recipe that is super easy to make. 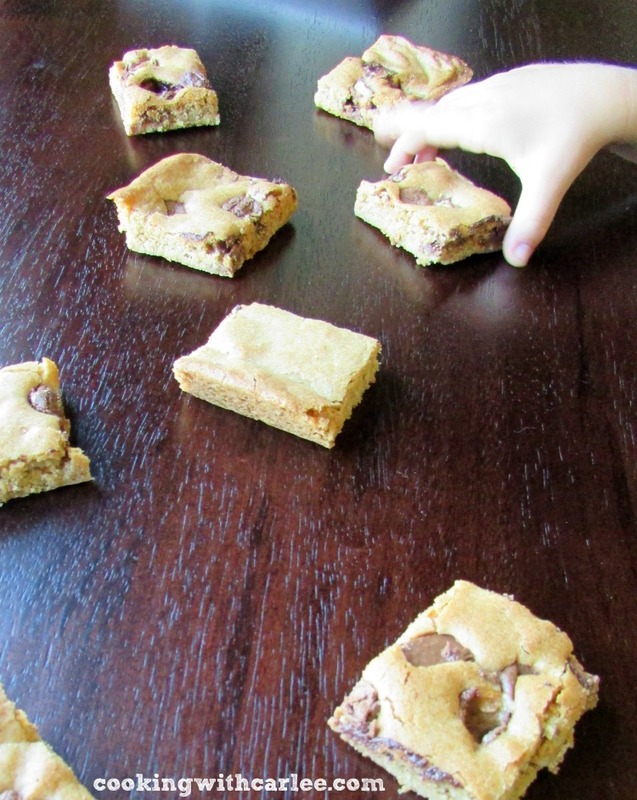 No fancy equipment, no complicated instructions, just yummy treats in a matter of minutes. You could pretty easily cut this recipe down if you want, but it is sized perfectly for taking to share with coworkers. Which is what I happened to do. I took the tray in when I arrived and got a text from my boss later saying they didn't last 45 minutes. There were only about a dozen people around that day due to vacations and whatnot, so I'll let you do the math. (I think they like them!) They would also be perfect for team treats or potlucks. You can certainly use chocolate chips or even better, chunks, if you don't have candy bars. But I like the fun variance of using leftover candies. Some bites have a bit of caramel, some have a little peanut and each bit is deliciously unique. If you have extra candy bars lying around after Halloween, Christmas or Easter, you can chop them up, freeze them and pull them out through out the year for delicious baked goods. (I know... extra candy?! Apparently that's a thing. Who knew?) If nothing else, you can make good use of the after holiday clearance candy! Preheat the oven to 350 F and spray your 10x15x1 pan (half sheet jelly roll pan) with non-stick spray. In a large bowl, stir together brown sugar and oil. Beat in the eggs and the vanilla. Stir in the dry ingredients until well mixed. Sprinkled chopped candy bar pieces over the top of the dough. Bake for 30-35 minutes. The edges should be golden and the middle should test clean with a toothpick is inserted. Cool completely and then cut into squares. Store in an airtight container. So fun!! I love the idea of throwing in whatever candy bars you like. I think I'll try three different ones and see if my family can guess which ones. Love these!! I had a mixed bag left over from a conference I exhibited at for work. Rather than bring the extra candy to the lab like I normally would, I baked them into these! They were really good that way too, I think this might be a post conference tradition! These must be ooey-gooey good! The people at my office would hate me, but eat every single one of them! I like easy and good recipes! They are! I'm sure they'd snap them up in a flash (and secretly enjoy every bite!) even if they are trying to be "good!" Thanks, Linda! Too funny! I will certainly eat pumpkin pie if it is place in front of me, but of all of the pumpkin treats it isn't my favorite either. Thanks so much! 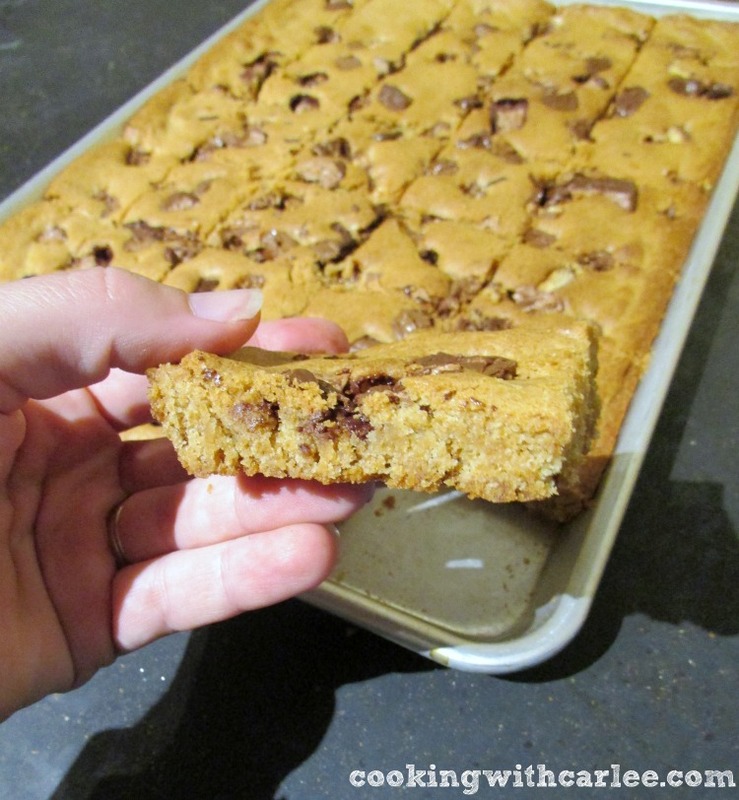 I could gobble up lotsa these blondies! Thanks for linking up with What's Cookin' Wednesday! Ha! Me too! Thanks, Karly! Mine did! They were gone in a jiffy which is always a good sign! These do sound so delish! Extra candy? Really? I've never heard of that! LOL At least not if it's chocolate. Perhaps there are other candies, the yucky kind, that could be left over. But never chocolate. But you could stock up after Easter and Halloween when the goodies go on sale. Then you could make these fun cookies all the time. I think I'm going to make a point of that. I love that they are bar style, no muss, no fuss, just delish! YUM! I know, extra candy bars seems like a fairy tale. But I made what I had left from a conference into bars so as to not just mindlessly eat it all myself! It would be a great way to use clearance candy or a good excuse to buy clearance candy if nothing else! I always need something sweet in my life! This would a great way to use some eggs! I hope you enjoy them! This is a very special treat, it looks awesome. Thanks so much for sharing with us at Full Plate Thursday, your recipe is great! Hope you have a wonderful week and come back to see us real soon.